"I have even more interesting news on Viktor. Seems there is not one, but two Hollywood movie projects in process that will feature Viktor (either in true name or by pseudo)!! Peter Landesman, who wrote the NYT piece on his interview with Viktor, has produced a screenplay also titled "Arms and the Man." This work has been picked up by Universal and will be directed by Michael Mann who has done such films as "Last of the Mohicans" and "Collateral." Seems Landesman will have Viktor involved in a plot to steal plutonium from the Ukraine but later will turn into a good guy after his brother, Sergei, is killed. Production is slated for 2005. The second project is an outgrowth of Douglas Farah's work "Blood from Stones." Farah has received two offers to option the movie rights to his work. One from a youngish director (I didn't get the name) who wants to do a feature film a la "Traffick" that will have a fictitious plotline overlain with actual facts. In this version, Bout will play only a secondary role to former Liberian strongman Charles Taylor and his merry band of thugs. The other offer is from a team that wants to produce a made-for-TV movie. Their version would be much more fictional with the lead character be a reporter who tracks Bout through Africa (think Indiana Jones with a tape recorder in lieu of a whip). Farah has to make his decision as to who to go with in the next 24 hours. You can find information on the Landesmann project on several Hollywood websites. The Farah project hasn't hit the press yet. Thought you might want to know. " "Arms and the Man (2005)"
Plot Outline: An American federal agent goes on an international hunt for some stolen plutonium -- a story inspired by an article on Victor Bout, widely known as the world's biggest arms trafficker. " "The fun doesn't stop with the two film projects I identified in my last message. "Just found another one that is already in production in South Africa, NYC, and Romania. 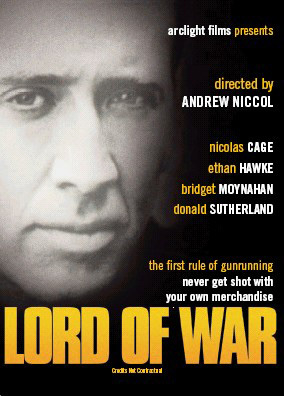 It is called "Lord of War" and stars Nicolas Cage. Cage, who plays a Russian arms trafficker (called Yuri Orlov in this project), is being pursued by a relentless Interpol agent played by Ethan Hawke. Donald Sutherland also appears in this flick. While Viktor's name is not used, the timing of the film indicates that someone jumped on the idea with both feet about the time that Landesman's NYT interview came out. Scheduled for release next year. Principal photography is underway in New York and Cape Town on one of the biggest independent feature films being made at the moment, the $US50M Lord of War, starring Nicolas Cage. Following two weeks in New York the cast and crew re-locate to South Africa this weekend on the controversial $US50M action thriller which also features Ethan Hawke. Among the major distributors are Momentum in the UK, Gaga in Japan, France’s M6, MGM-UA in Germany, Columbia Tri-Star for Spain, Italian International Film in Italy, Scanbox in Scandinavia, and Hoyts/MGM-UA for Australia. The film is produced by Philippe Rousselet and written and directed by Andrew Niccol, Oscar nominated writer of The Truman Show, and writer and director of Gattaca and Simone. Niccol also wrote the screenplay for the upcoming Spielberg directed Terminal. Niccol based the screenplay on fact, with the lead character played by Nicolas Cage a composite of several actual gunrunners. 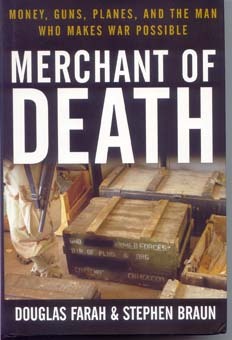 The film explores a little-known consequence of the end of the Cold War — the enormous quantity of arms that suddenly became available for sale by former Soviet states to developing countries (especially in Africa) and the vast sums of money made by the arms dealers who sold them; many believe it is the greatest heist of the 20th century. Additional cast includes Jared Leto, Bridget Moynahan and Ian Holm. Lord of War is an international co-production between Philippe Rousselet, who is partnered with Andrew Niccol in newly formed EMC (Entertainment Manufacturing Company), Ascendant Pictures (Chris Roberts and Chris Eberts) in association with VIP3 Medienfonds (Andreas Schmid and Andreas Grosch), Saturn Films (Nicolas Cage and Norm Golightly) in association with Endgame Entertainment. Serendipitous for Cape Town too. Long a favorite location for fashion shoots and advertising stills, the city is also catching on with major film producers. After Towne wraps up his last scene, "Lord of War," a production about a global arms dealer played by Nicolas Cage, will begin filming this month. In it, Cape Town will pose as 57 different settings in the Middle East, Afghanistan, Bolivia, Sierra Leon and elsewhere. Hollywood mega-star Nicolas Cage is in Cape Town for his latest role in the movie Lord Of War. But the local film industry is being very "cagey" about the shoot as they don't want to divulge too much and upset any of the cast. The Oscar winner is not the only Hollywood star in the Mother City for film shoots this month. Sean Penn and his wife Robin are also on their way to film The Last Face. Cage plays a Russian arms dealer on the run from an Interpol agent, played by Ethan Hawke, in the R273-million movie being filmed on the Foreshore. It was written, and will be directed by, Andrew Niccol who was nominated for an Oscar for writing the screenplay for The Truman Show. Cage is also one of the producers of the film which also stars Monica Bellucci, Jared Leto and Donald Sutherland. Filming had started recently and Cage was on set almost every day. A Cape Town Film Commission spokesperson said this was one of the bigger movies being shot in the city. "The first couple of weeks are extremely sensitive. We don't want to upset any of the actors. We don't want to piss anyone off. If something went wrong they could easily pack up and leave and continue shooting somewhere else," she said. This An-12 is 9Q-CIH as can be easily read in the movie; this aircraft (c/n4341803) crashed on 08Jan05 11 kms from Entebbe after departing EBB loaded with relief goods for Kinshasa. Q: Do you have a sense from the people you worked with in researching this topic that their world has changed as a result of U.N. investigations and other attention to the problem of huge and unregulated arms sales from the former Soviet Union? Is the party over? Answer: No, I don’t believe that the party’s over at all. Even in the making of this film, life kept imitating art. All the tanks you see in the movie were owned by one private arms dealer. He said I could have them until December because then he was going to sell them to Libya. I guess I just assumed it was a legal deal, but it’s so hard to tell what’s legal and what’s illegal. The armory that Nicolas Cage’s character walks through with his uncle: there are 3,000 guns there, but they’re all real, because it’s far easier to get real guns than fake guns. So we bought 3,000 Kalashnikovs [AK-47 assault rifles]. And the fact that you can do that is very sobering to me. Q: And sold them back? Answer: Yeah, just sort of an elaborate rental. But for me the point was—you can get 3,000 Kalashnikovs, just with a phone call, in the Czech Republic? There are still a million AK-47s in Ukraine. These are going to end up somewhere, because it’s such a lucrative business. 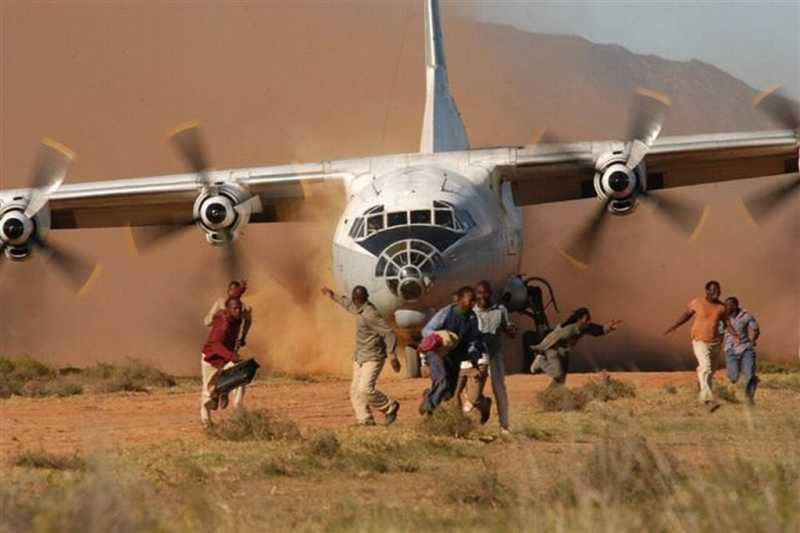 And that [cargo] plane that we feature in the movie, that was rented from one of the most notorious arms dealers in Africa. Answer: Well, I suppose I can say that it was Viktor Bout’s plane. The crew said that plane ran real guns into the Congo the week before we were using it to film fake guns. That plane has since crashed, running something described as suspicious cargo out of Uganda. And yet these guys would say, "We used to do some shady things, but now it’s freight." What kind of freight is it? They were almost flattered by the attention, almost the way mobsters are. Nicolas Cage would never have his photograph taken with any of these guys. It was frightening to me that the only way to get this film made was to use the arms dealers I was portraying. It has been suggested that the Antonov An-12 in question was 9L-LEC and was part of Skylink when that firm was running supplies into Baghdad for the US military. "Angelina Jolie, playing the role of Kathi Lynn Austin, will star in another true story soon: the tale of intelligence operative Kathi Lynn Austin, according to Variety. Austin, who has most recently worked on contract for the U.N. Security Council, has undertaken field missions in Africa, Europe, Southeast Asia and Central America. The drama will focus on a fictional arms dealer inspired by Victor Bout, the shadowy Russian who is considered one of the world's most prolific dealers in illegal munitions." Further reports and updates will be welcomed.